Great news for fans of Catfish And The Bottlemen. The stunning band will be promoting their brand new album The Ride by playing headline shows at Derby Arena and Ricoh Arena in Coventry. They will also be in attendance at a fine array of festivals including the Bristol Summer Series, Sounds Of The City, Truck Festival, Tramlines and Y Not. 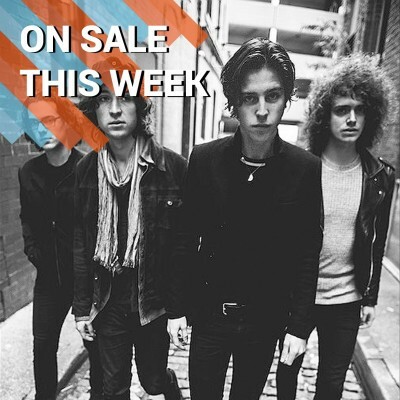 Click HERE for your Catfish And The Bottlemen tickets. Bad Company are back on tour for the first time in four years. Their hits include Can't Get Enough, Good Lovin' Gone Bad, and Feel Like Makin' Love. The ultimate supergroup will return to play all across the UK and are raring to go. Click HERE for your Bad Company Tickets. Disney On Ice presents Frozen is a true treat for all the family. The Academy Award® winning enchanted tale has been re-imagined as an impeccable production on ice featuring unforgettable special effects. See all your favourite characters including the royal sisters Anna and Elsa plus their hilarious friend Olaf, Kristoff and Sven while you sing along in celebration to the magic of true love. Click HERE for your Disney On Ice presents Frozen tickets. Pianist and composer beyond compare; Ludovico Einaudi will be performing a number of nights at the Royal Festival Hall in London this July. The virtuoso studied at the Conservatorio Verdi in Milan before expanding his horizons to write music for a series of dance productions and multimedia projects. He became enthused by soundtracks and has provided the scores the films The Intouchables and I’m Still Here. Click HERE for your Ludovico Einaudi tickets. Coming on sale very soon we have a whole host of massive metal bands including Meshuggah, Of Mice & Men, Lacuna Coil, Sabaton and Saxon. Fans of rising star Ady Suleiman will be looking forward to his upcoming performances, Lucky Chops have certainly got some brass and psychedelic jazz band Syd Arthur are perfect for summer. Being only the second ever year of the festival, Citadel is incredibly fresh and exciting. Boasting an impressive headline roster which includes the outstanding Icelandic post rock wonders Sigur Rós and the ever experimental sonic delight of Caribou. All on board for the wild ride with Tramlines. Taking place across the very best venues the spectacular city of Sheffield has to offer - you can expect to see the likes of The Dandy Warhols, Kate Jackson, Big Narstie plus many more. Click HERE for your Tramlines tickets. Wireless continues to draw the biggest names in the world to their stages. This year sees sets from Calvin Harris, Chase & Status plus J. Cole. With such massive names playing you know you need to go! Click HERE for your Wireless tickets. Also on sale we have Crosa Rosa fresh from playing their amazing sets at Dot To Dot Festival, seminal indie band The Wedding Present, alt rockers Nothing But Thieves play around the UK and ska legends Madness will be taking over Clapham Common with their House Of Common day out. Donny Soldier MC Devvo will be showing the entire country how to be boshty as owt, Hot Dub Time Machine will time warp your brain across the century and Shaun Ryder is letting us in on some of his best party stories. We’ve always got the tickets you need so always stay with Gigantic.